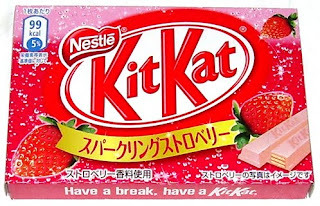 The latest Kit-kat to hit the shelves is Sparkling Strawberry and it's the best yet. (Well, actually tied with Salt; they're both delish.) It has the standard creamy white chocolate taste with the perfect tart bite of strawberry at the end. Pepsi should take a lesson from Kit-kit; it's not enough to just keep coming out with weird flavors, they have to actually taste good too.